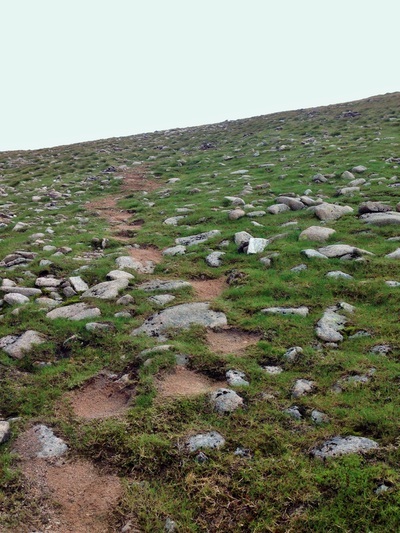 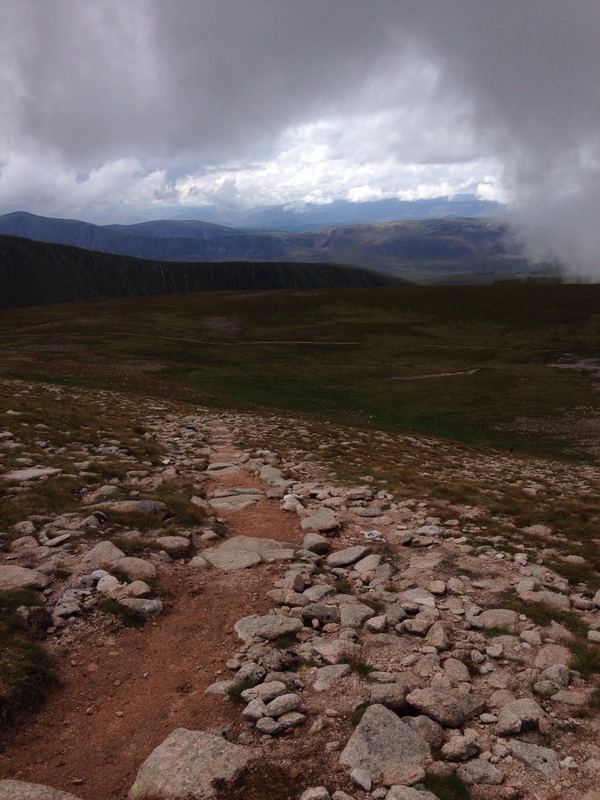 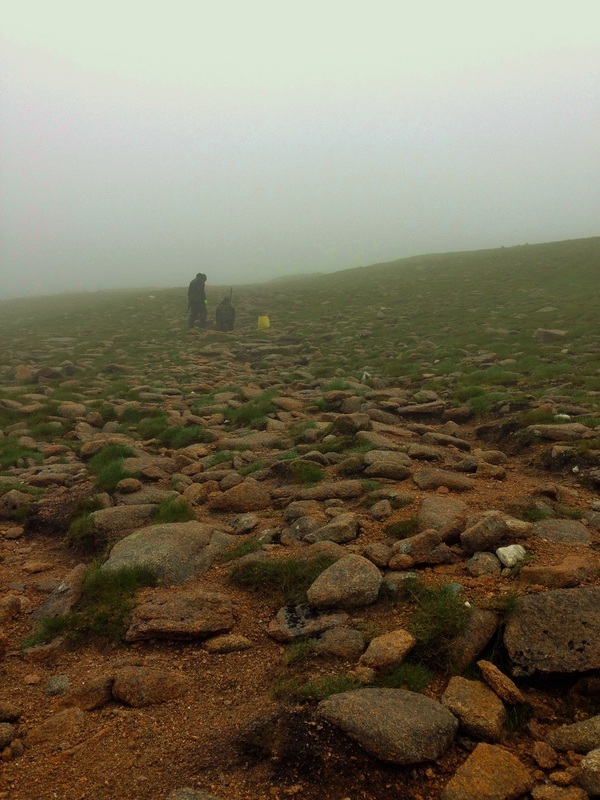 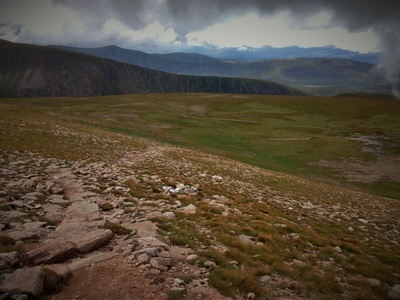 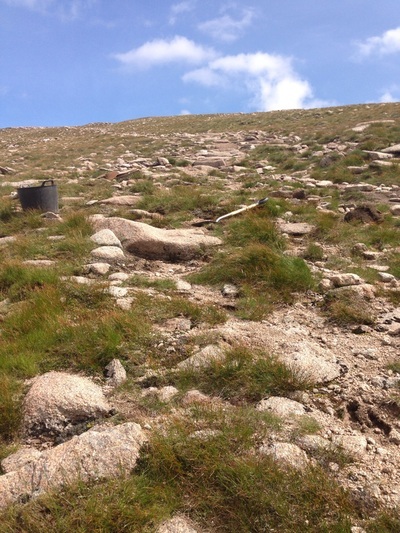 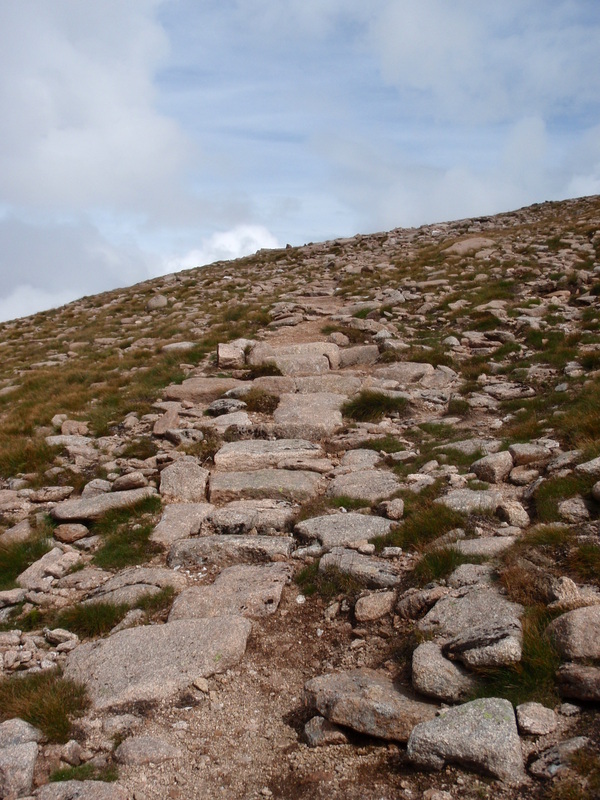 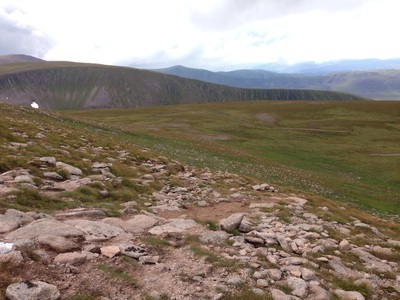 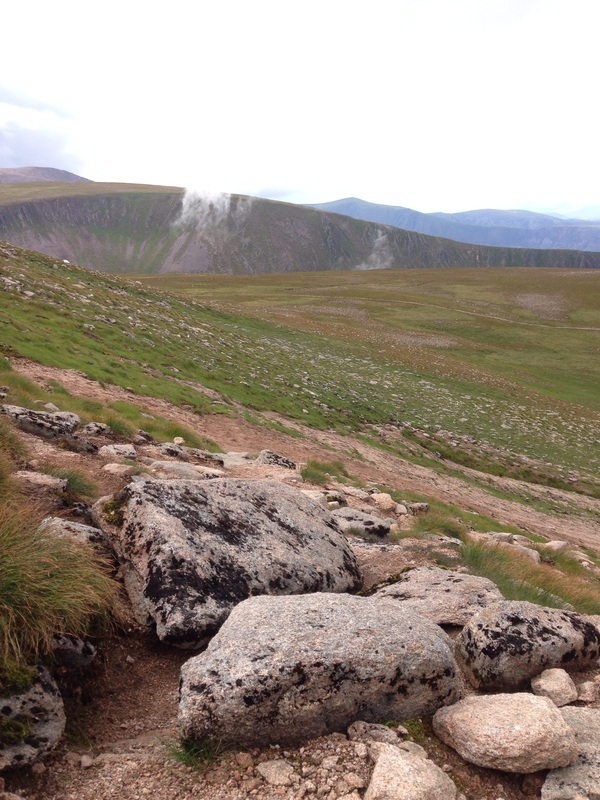 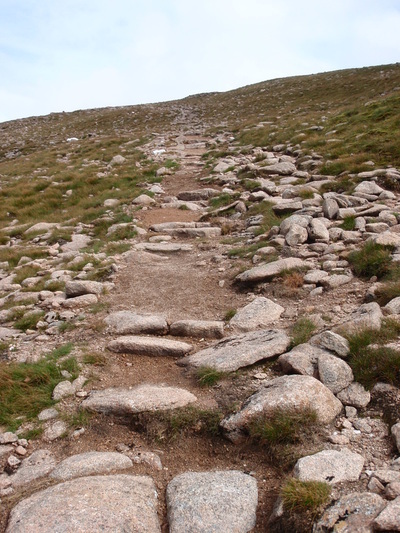 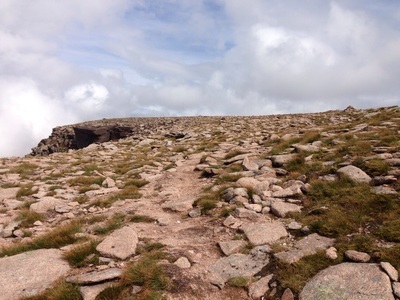 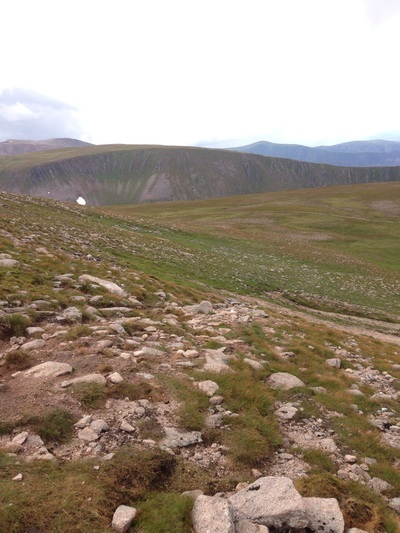 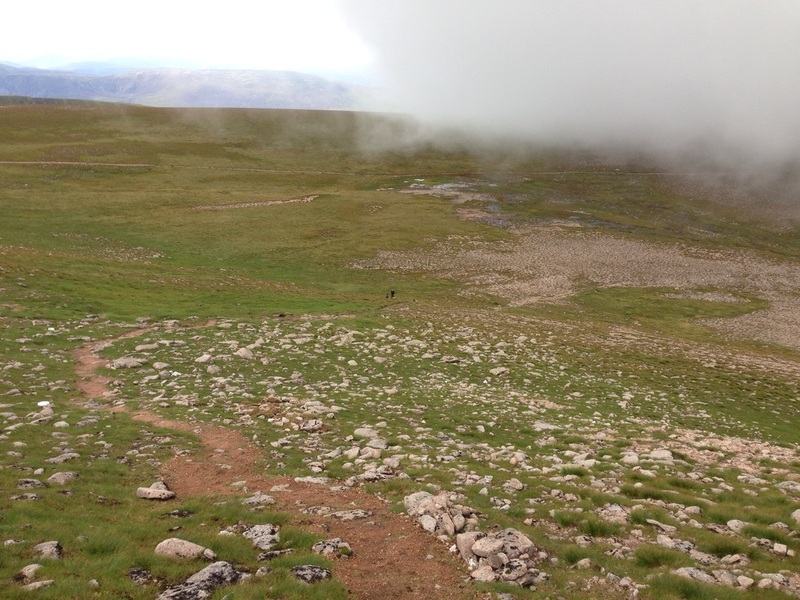 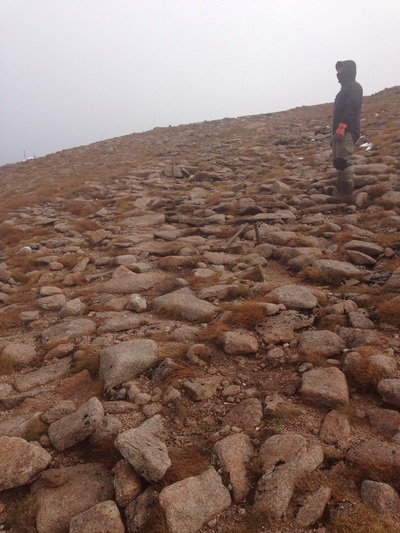 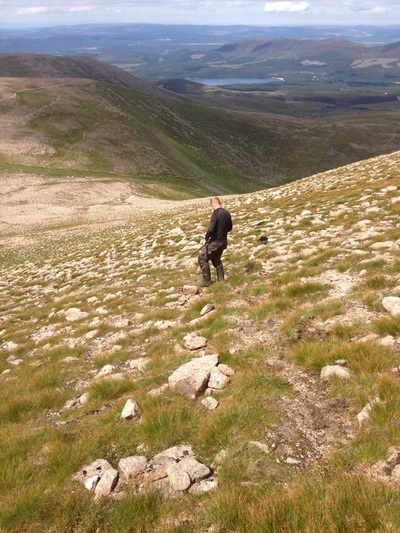 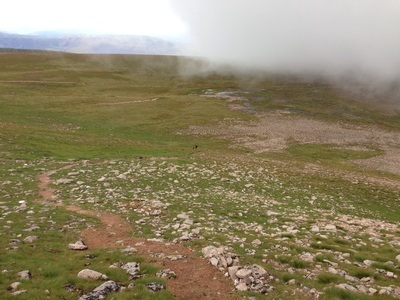 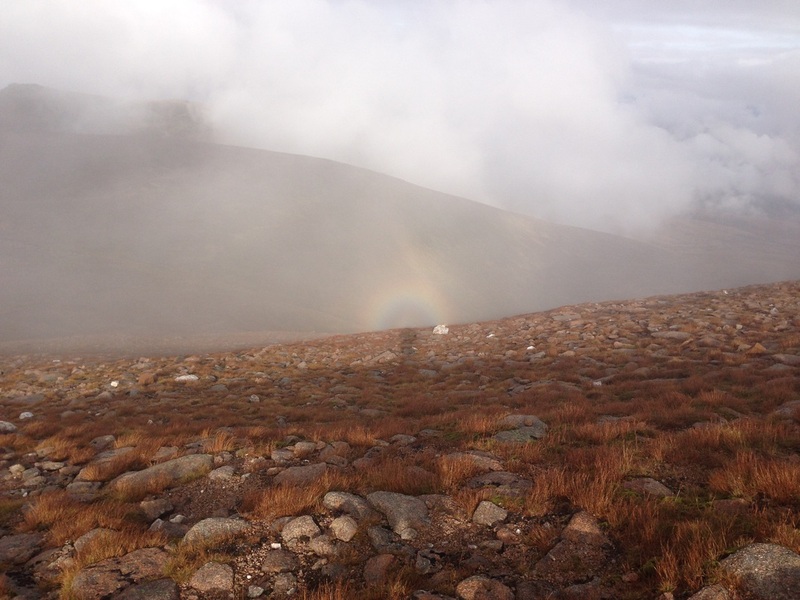 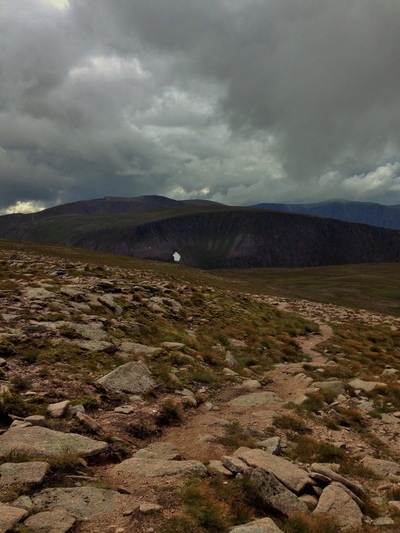 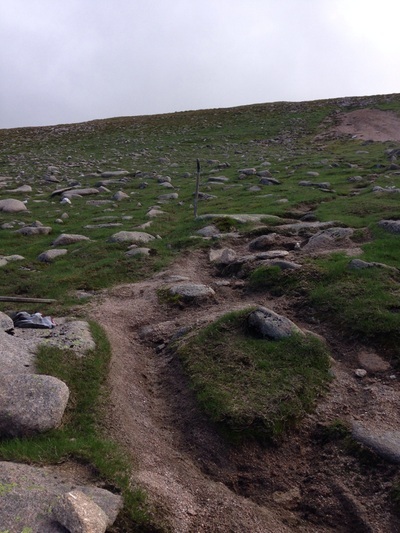 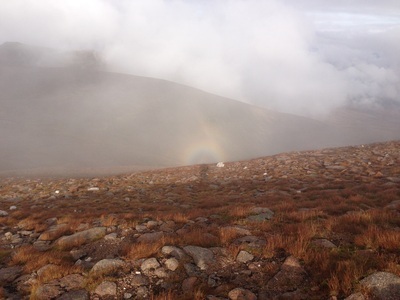 2014 saw us returning to the Northern Corries to complete another section of light touch path works. 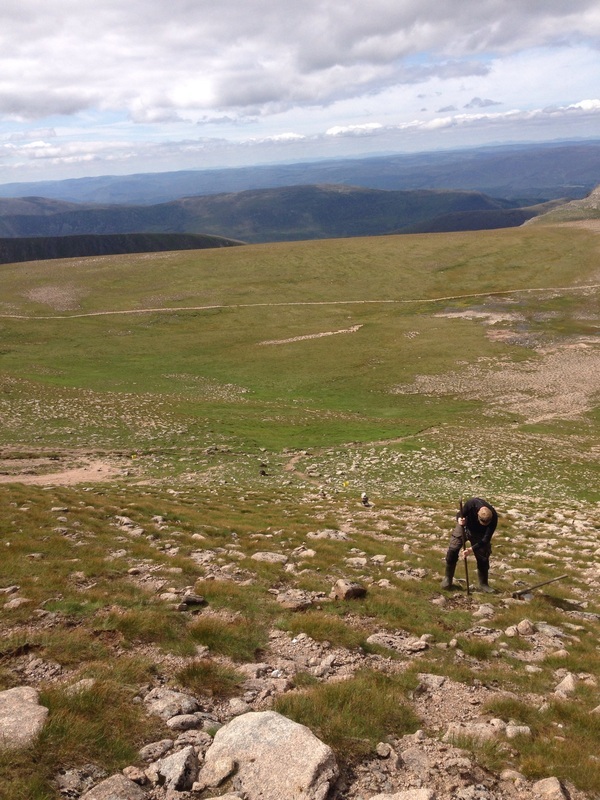 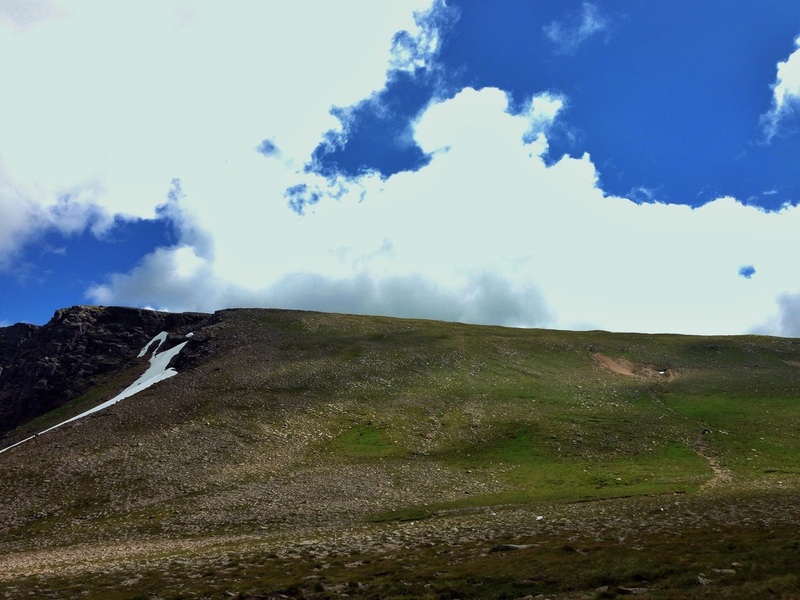 This seasons work involved working from Cairn Lochan (1215m) down to the area known as Lurchers Meadows. 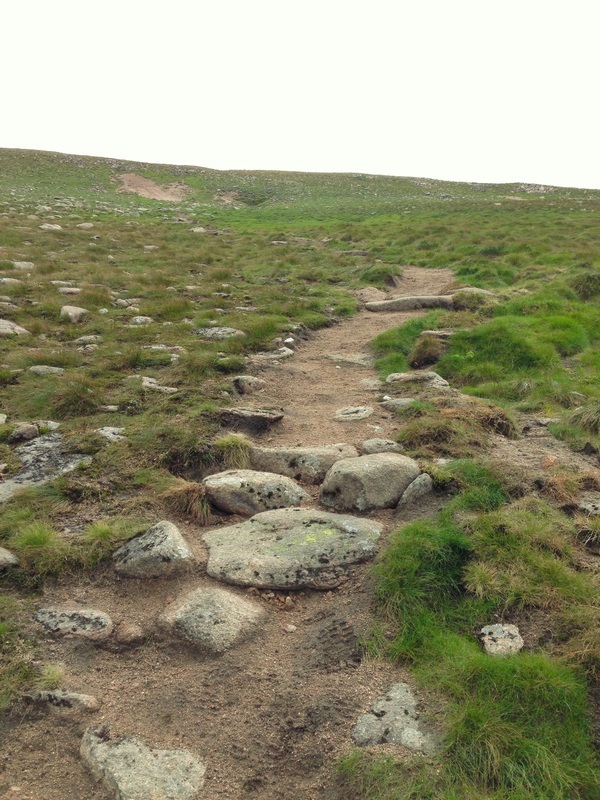 The priority here was to create a desire line that people could follow and avoid an obvious scar through a geologically important area that had become the most obvious line to use. 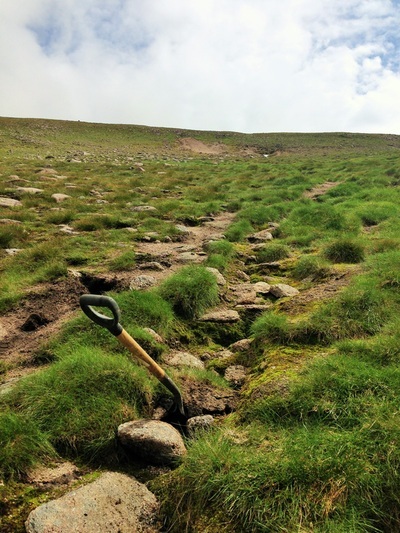 The lower sections had really suffered in the last few years from the snow melt waters cutting down through the light top soils and leaving large gullies which each spring were getting deeper and wider. By cutting a stronger line lower down, using aggregate material out of the gullies and pinning that surfacing into the path tray with step risers and anchor bars, we were able to start to guide people away from the heavily damaged area. 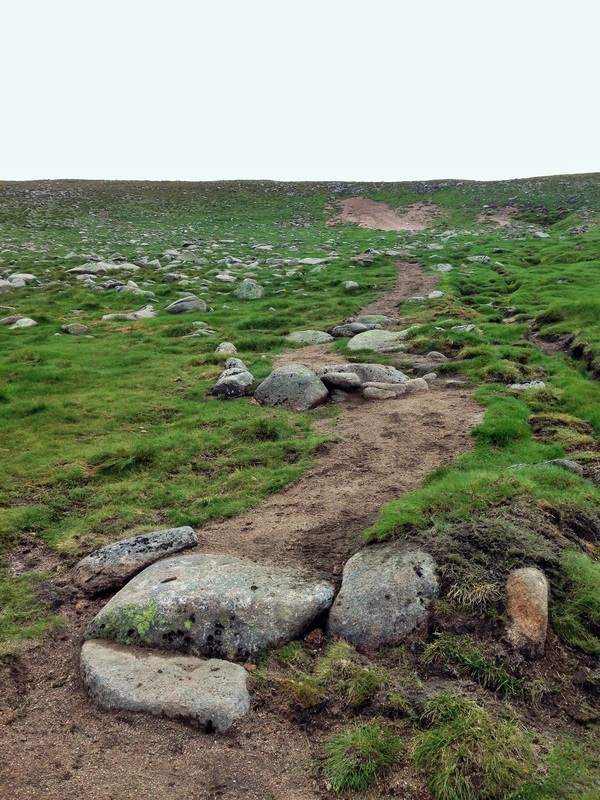 At the damaged site we used extensive landscaping techniques to hide the old route, whilst simultaneously creating a visual desire line further to the left. 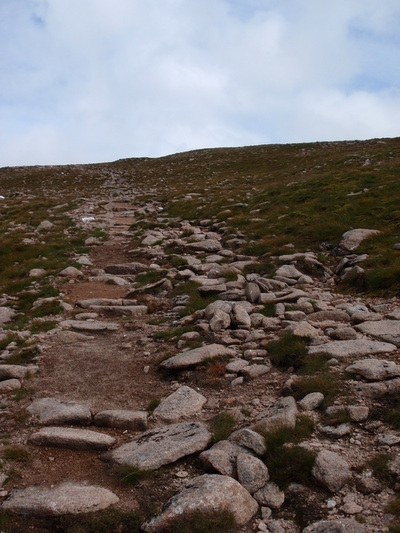 This was done by creating small areas which would catch the eye and act as clues as to the correct way up. 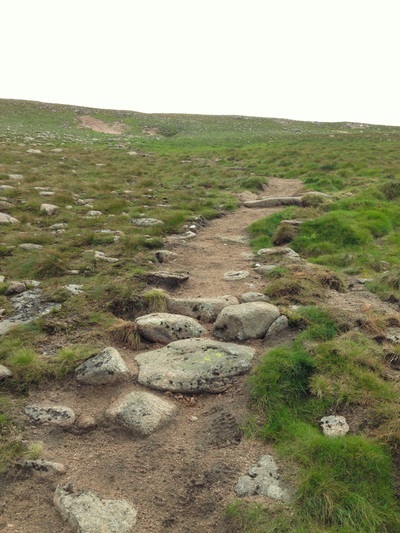 For the path leading down, the aim was to reroute the path before the damaged area came into view, and that way walkers could be encouraged onto the new line. This was a challenging job as there were lots of different possible lines we could of taken, and our aim was not to have a fully built path which would have had a visual impact from the other side of Lurchers Meadows. 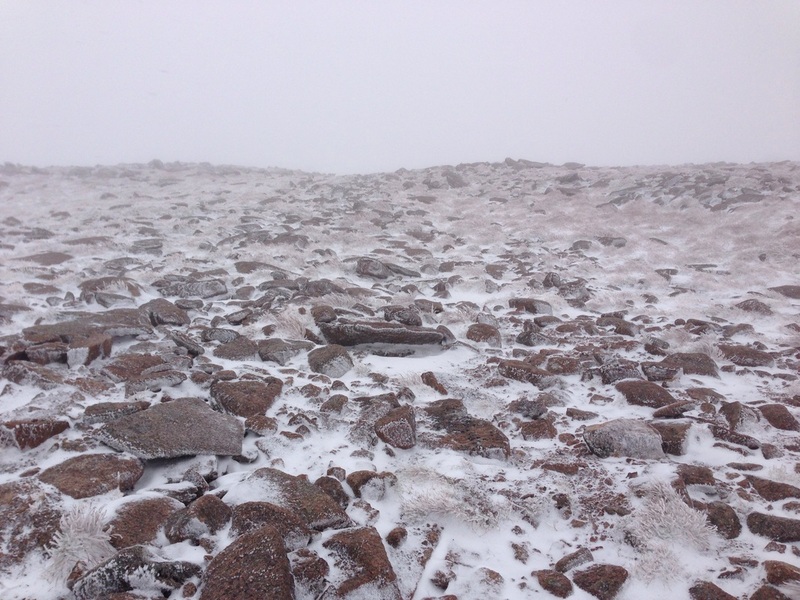 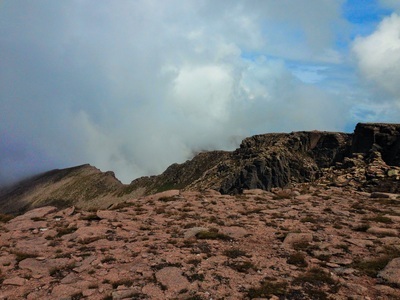 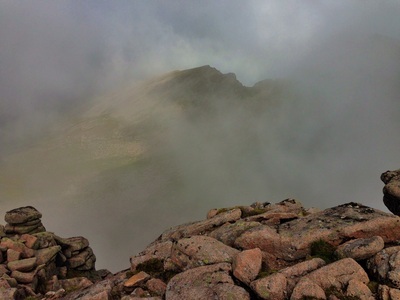 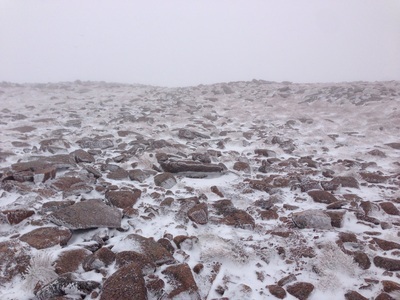 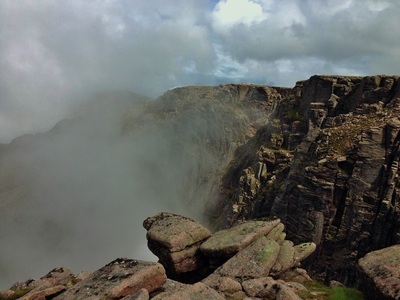 Nearing the summit of Cairn Lochan at the end of 2013. 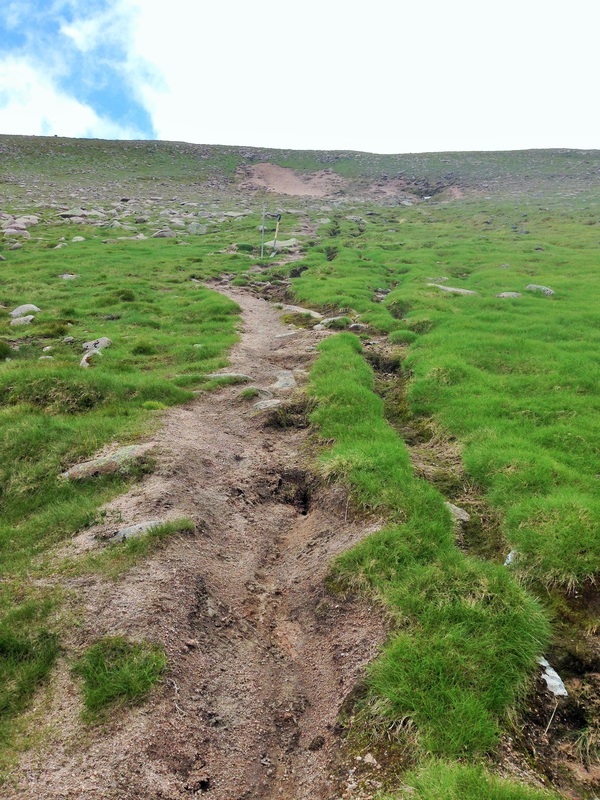 Erosion damage as seen from the Lurchers Meadows approach. The damage extends all the way to the alluvial scar at the top of picture. Picking a new line to the left of the old scar. 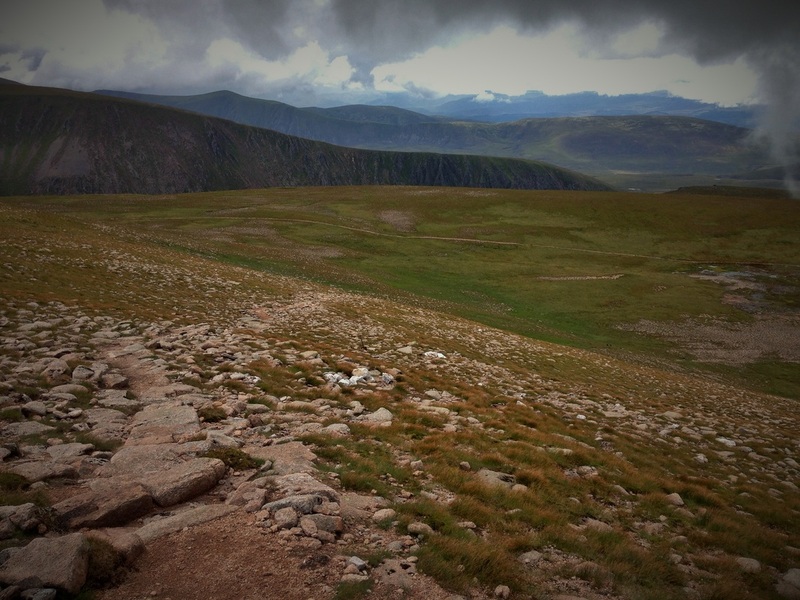 Anchor bars and step risers. 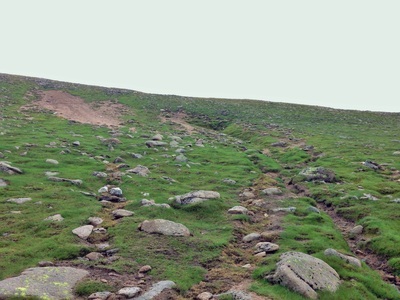 Landscaping of the old scars. 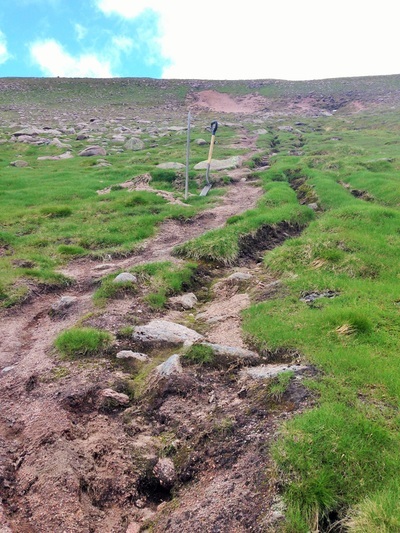 hopefully this will stop people using the old damaged line to the right of picture. Defining a line up to the new path which is over the horizon. 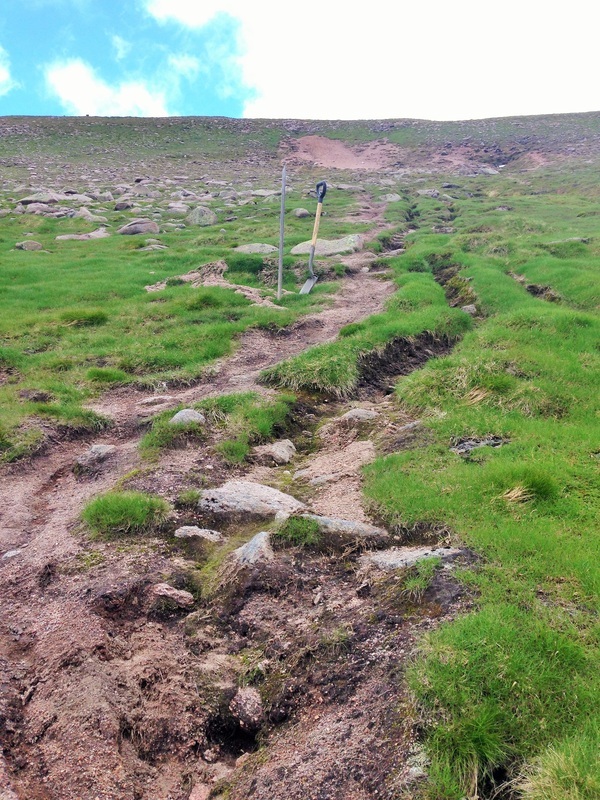 Path cleared of lose stone and anchor bars to pin aggregate and prevent wash out. 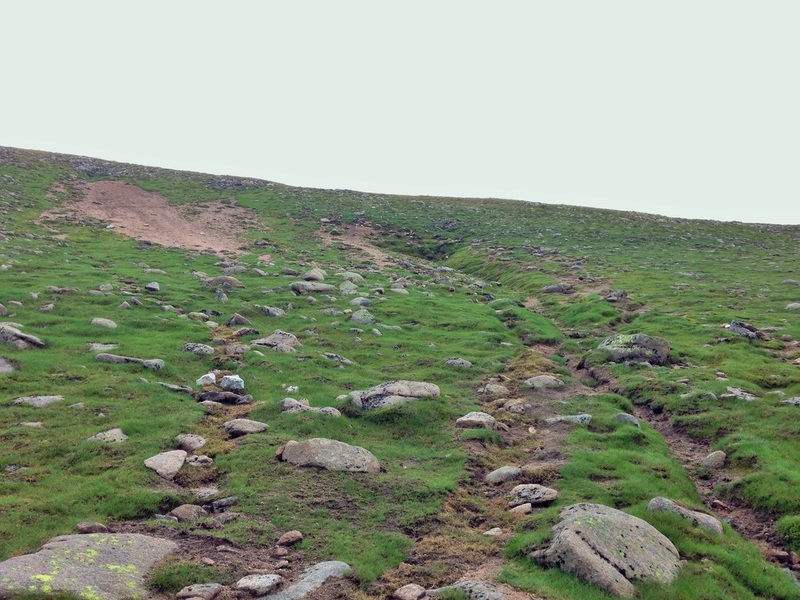 Some small areas of pitching were added to reduce the gradient in places. Views over the Northern Corries. 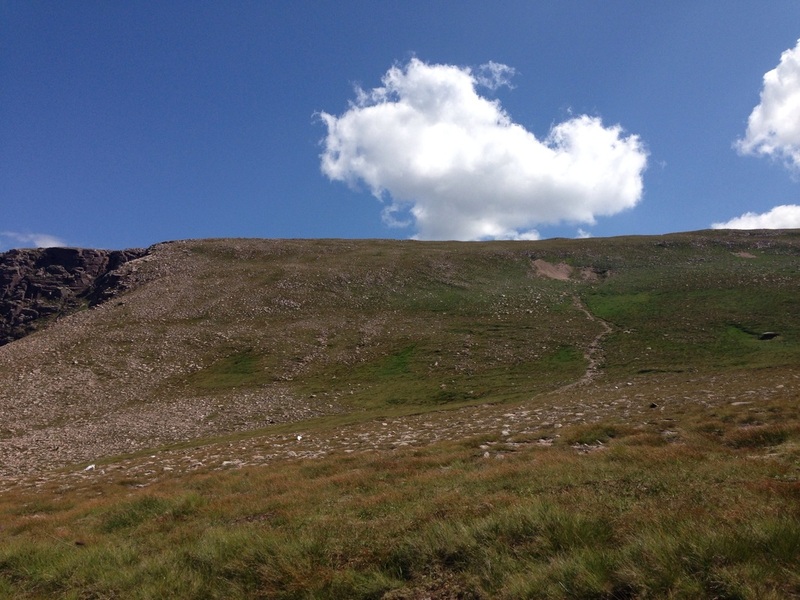 So lucky to call these places our offices. 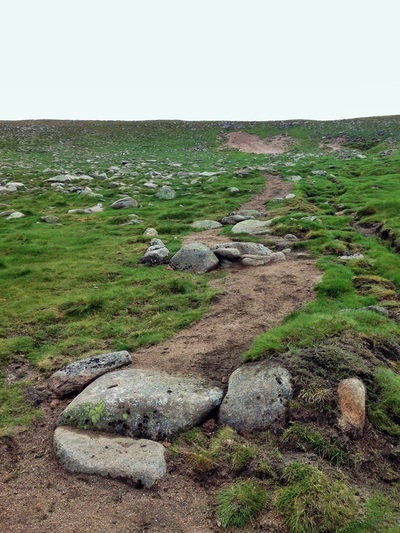 Blocking and landscaping to discourage walking down the old eroded areas. Deciding on the new line. 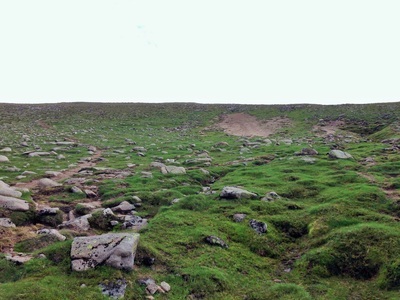 Looking down at Lurchers Meadows. 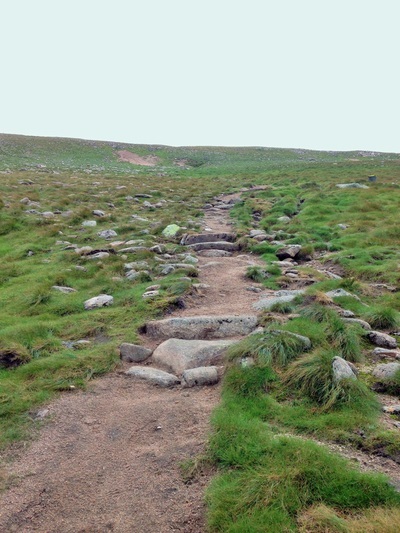 The new line to tie the top and bottom paths together. 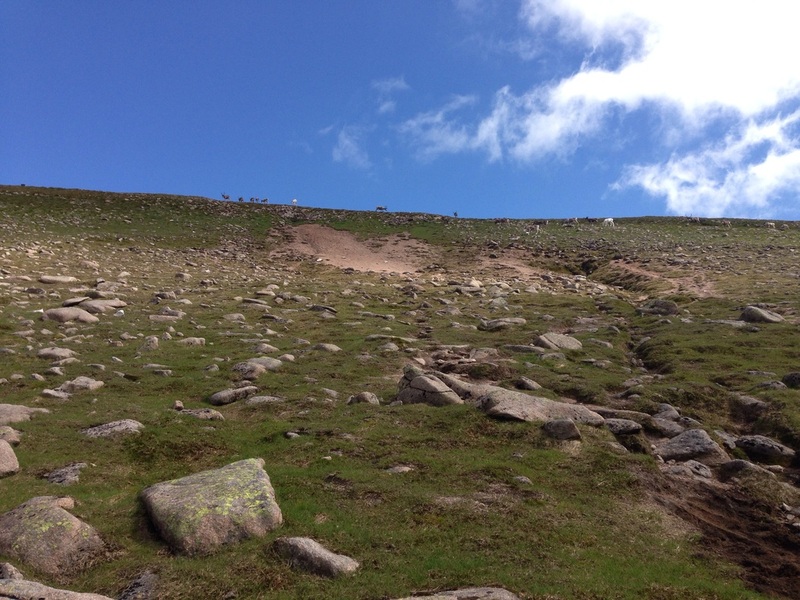 And completed. 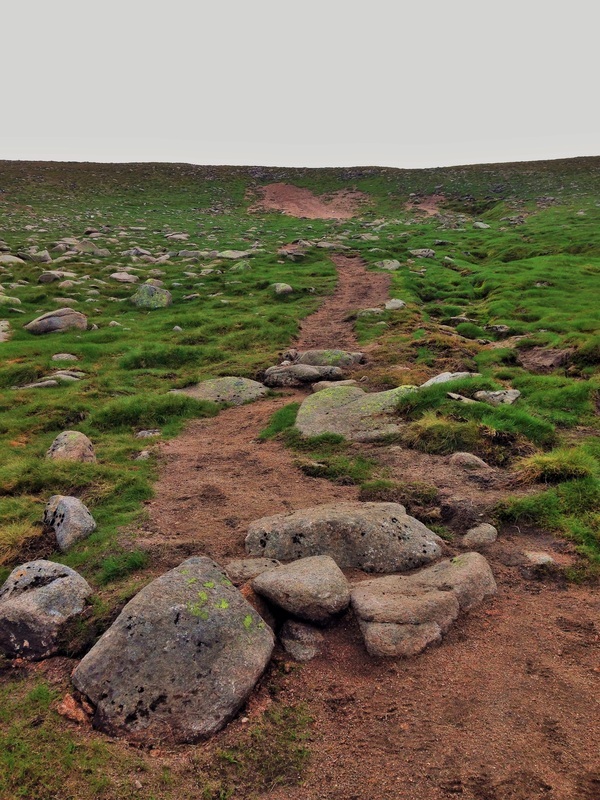 The path is more defined and now runs to the left of the alluvial scar.